Hold a Key for 2 second to activate it. What I have seen is this: Hold down a Key for 2 second (Shift for example). Then write something and the written text was as if the Shift key is pressed (and it acts like the Caps Lock pressed). Then the key is pressed one time to deactivate it. Is it possible to achieve this on a mac too? Type in sticky in the search bar and hit enter. One problem with sticky keys is that there is a short delay before sticky keys get registered. If for example you press shift and z immediately after it, z is not capitalized. See this question. 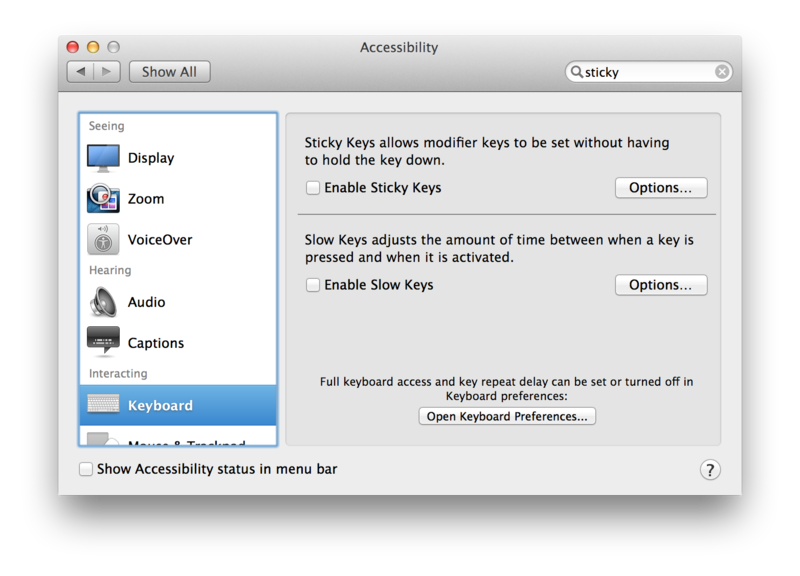 KeyRemap4MacBook has its own implementation of sticky keys which doesn't have that issue.